Anything but a bourgeois mobile! At first sight, the two did not make a perfect match at all. He, Arist Dethleffs, son of an old-established family business from the Allgäu, that has manufactured horse whips since 1832 and later on also ski sticks made of hazelnut. And her, Fridel Edelmann, a modern and emancipated woman, who fulfilled her life's dream at the beginning of the 20th century and became popular all over the country as a landscape paintress – at a time, where painting professionally was only a men's business. The exceptional relationship between the whip manufacturer and the ten years older artist would not have been worth mentioning, when something very special had not emerged from this love. An invention, that should change Germany's urban landscape and bless tourism on a long-term basis with billions in turnover: the first German caravan. Later on, these homes on wheels became the epitome of bourgeoisie over here. They were scorned to be the refuge of notorious misers or chavvy workers, who could not afford going on holidays. A misunderstanding, as the birth of the first caravan in Germany was not at all owed to the compulsion of stinginess, but to the desire for independence and freedom. As Arist Dethleffs was travelling a lot being a salesman in the name of his father's company, his fiancee Fridel Edelmann did not see her future husband very often. In addition, she was a master student of a renowned art professor and thus often was in Paris and Florence herself. Unhappy with her situation, she told her fiancee of her diary entry of 1924: "Made plans for our future caravan". Yet, Arist Dethleffs was not involved in the plans of 1924. She thus had to wait with the fulfillment of her desire until she got to know Arist Dethleffs. What took a long time before, then went on very fast. Enthused by the idea, Arist Dethleffs started to work. His drafts for the German original caravan showed a two-wheel trailer with a small kitchen and a sitting area that could be converted into a sleeping berth. Already at that time, Dethleffs desigend an elevating roof in the middle of the trailer. This had two advantages: better aerodynamics during driving and more space and light for the painting wife when the roof was elevated. The first caravan in Germany thus was not designed to be a holiday mobile, but a mixture of rolling studio and residence on wheels. The exact point of time when the first caravan was finished, even cannot tell the company Dethleffs today: it must have been between the end of 1931 and at the beginning of 1932. Only this is known: In Ottersweier – when visiting the parents of Fridel – the first true to scale plans shall have been drawn at the barn door outdoors. The mayor of Ottersweier is only recently looking for the old photos of this barn door construction. The rest was left to imagination: "Table and chair were set up in the original to define the correct measurements," wrote Ursula Dethleffs, daughter of the caravan pioneer, later on. "Mother acted in front of an imaginary kitchen, father tested the necessary standing height. It must have been huge fun." From the parents' hobby slowly arose a wooden rectangular frame that was three metres long and one and a half metres wide being covered with double coated, waterproof wooden plates. "Wohnauto" (Living car) Fridel and Arist called their self-made construction with the inventive trailer mount that he made of two rings and an eyelet. The garage boffin could not have made a bigger wedding present to his wife. On Easter Tuesday 1932, the newly weds attached the trailer to their Opel convertable and drove off. With the first endurance tests, a lot went wrong. When the hardly sprung "Wohnauto" jolted over cobblestones and railway crossings, the storage compartments on the inside opened. A horror, that is known to many campers of today – only that no plastic dishes fell out at that time, but real porcelain plates. In addition, the spirit stove turned cooking in the wooden construction into a really unpredictable venture. Once again, the spurting flames came out of the stove, the frustrated cook threw it out of the caravan, waiting until it was burnt out outside. 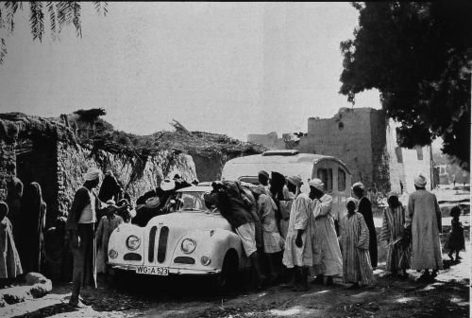 The enthusiasm of the Germans compensated for such breakdowns: As soon as the young couple rested, clusters of people formed gazing at the extraordinay vehicle. Although they knew similar constructions that were pulled by horses from showmen. Yet such a small, motorised version driven by an entrepreneur and his painting wife, they had never seen before. At the end of their first travel, Arist Dethleffs returned with a writing block full of orders. Without only having had the slightest idea when starting his trip, he had just made the best advertising for a business that soon should boom. In doing so, the idea for a habitable trailer was not new at all. Showmen have already been using them since the beginning of the 19th century. Also few private people travelled with them. The British Samuel White Baker for example drove already in 1878 in a caravan that was pulled by oxen on an expedition to Cyprus. Later, he raved about his rolling home with bed, wardrobe and chest of drawers: "It offers such a luxury that I, if the world was belted by a good road instead of an useless equator, would travel around it all the time." His compatriot Gordon Stables became known on the island as "gentleman gipsy" when he designed a luxurious trailer pulled by two horses in 1885 and then travelled through England. This six metres long and two metres wide trailer weighed two tons and moved forward in snail's pace. Yet, it was coated in mahagoni on the inside and offered space for a small stove, a salon with double doors, a sleeping couch, gold-plated candlesticks and Persian carpets. Being enthused about this, the British founded the first British Caravan Club shortly after. In comparison, the Germans still loved it more simple and practical even decades later – above all Arist Dethleffs. He took his daughter Ursula on trips in the caravan, when she was only just a few months old. With Swabian pragmatism he also found a solution for her dirty nappies: He put them into a sheet tub filled with Persil lye under the floor hatch - the jolting during driving took over the work of the washing machine. Ursula Dethleffs characterised herself later as a "caravan child". She spent half of her youth in the jolting self-made constructions, as her travelling parents dared to discover more and more exotic realms and thus drove to Egypt, the Lebanon or the Sovjet Union. Most of the time, the family met other adventurous travelers on these trips and returned home with new orders. In a barn, Arist Dethleffs then manufactured the first individual pieces and fine-tuned on the trailer body: The once square wooden box on wheels became round, more streamlined and got a coating made of aluminium. In 1936, Arist already had hired six employees – despite the mistrust of his father Albert, who solely saw the future in the production of whips and ski sticks. He was wrong: The Germans loved the new way of travelling. It was the inadequacies of the first caravans which they perceived as pure romance and thus they were willing to pay 2000 Reichsmark and more for their escape into the spartan cosiness. Particularly then, when the interior decoration was designed in the distinctive style of Fridel Dethleffs-Edelmann. In addition, the customers did not sleep on thin foam, but on innerspring mattresses. The Dethleffs family not only sold caravans, but travelled themselves very far. Soon other manufacturers copied Dethleffs' concept, the Swabian now faced competition. Only the outbreak of war in 1939, abruptly stopped the first bloom of this young industry. The entrepreneur returned in time from the front in order to take part in the gold-rush fever of the 1950s. 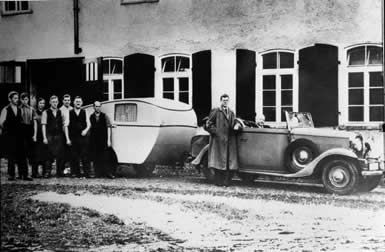 During and after reconstruction, the Germans longed for normality and the manufacturing of caravans became the mirror of post-war society: In the past, early models served as an alternative to a tent and weighed just 200 kilograms, now the carvanas grew together with the economic miracle: The rear became wider, the trailer body suddenly measured up to five metres, the overall weight multiplied. Dethleffs fought with manufacturers like Wilke, Tabbert, Knaus and Bürstner for the growing number of solvent customers. Luxury models already cost around 15.000 Marks during the middle of the 1960s – the price of a Mercedes. It did not take long until the first very primitive trailers turned into heavyweight, pimped apartments on wheels. Of course being equipped with fridge, chemical toilet, waterbed and satellite TV. From the odd idea of a rolling art studio of the newly in love couple, an industry has long since developed being worth billions. Dethleffs, the small factory of 1931, today employs around 700 workers and last had a turnover of 272 million euros. The times of ski sticks and whips are over – since 1973 only caravans have left the production facilities in the Allgäu. Yet, since 1983 motor caravans, that have become more and more important, complement the company's portfolio. In 1970, the Dethleffs family sold the company. Arist Dethleffs had become ill and later on also went blind. Wolfgang Thrun and Jakob Eicker, the manufacturers of the TE-Wohnwagen became the new happy owners of Dethleffs. The company kept on growing. In 1980, Erwin Hymer, manufacturer of the Eriba-Wohnwagen and Hymermobile, integrated his company into the new group "CMC-Thrun-Hymer-Eicker-OHG". Today, Erwin Hymer is the sole owner of the group, that has grown continually. SPIEGEL-ONLINE Wednesday, 02.02.2011 - complemented with new information by Bernd Riedle – nephew of Arist Dethleffs. He was the former Managing Director of the Dethleffs GmbH and Central Managing Director of the CMC group.